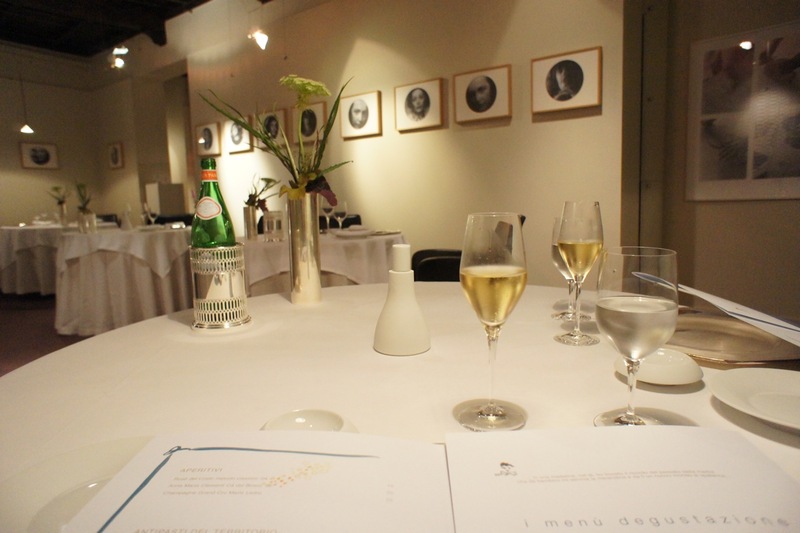 Osteria Francescana is a 2-Michelin star modern European restaurant in Modena, an affluent city in Emilia-Romagne and an hour's drive from Bologna (where we were staying). 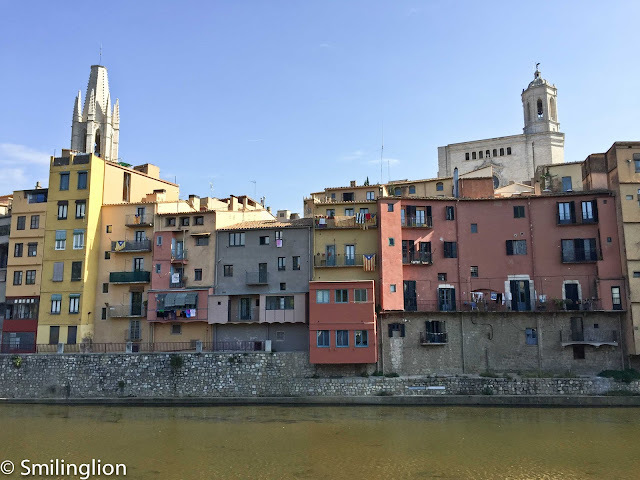 Modena is better known as one of the main centres of Ferarri, being the city nearest to the town of Marenello where the car company has it's headquarters. The restaurant is located in a restricted area of the town centre, and hence we had to park a short distance away and walk (it was raining and cold that night). 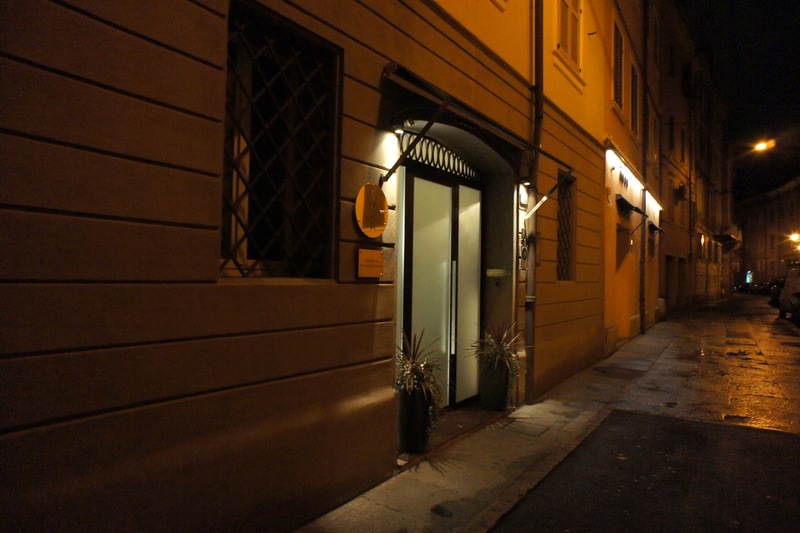 Francescana has a very non-descript entrance along a quiet residential part of the old town, where after dark, you'd be hard-pressed to run into anyone or see any traffic along the cobblestone streets. It's hard to tell if anyone's at home as the windows are typically boarded up, and our footsteps echoed loudly in the dark. The restaurant itself has its entrance on a deserted street where nothing else was happening that night (it was a Monday night though). We escaped the cold and wet outside and stepped into the restaurant which was quite small and cozy. 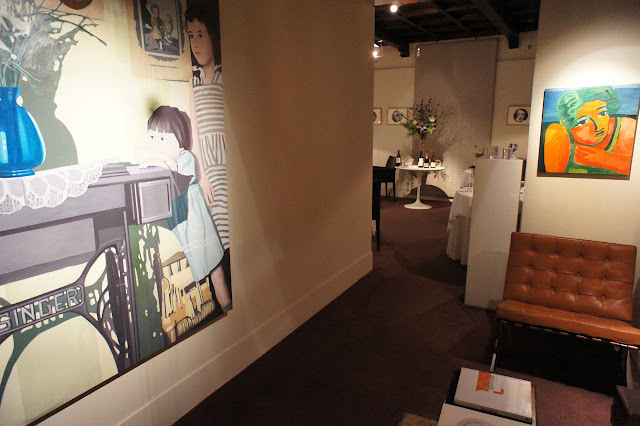 The interior decor was modern chic with interesting artwork on its walls. The dining room had 8 large tables which were widely spaced out. On its walls were interesting photography works of various people (could only recognise Edith Piaf). Opposite the kitchen was a private room which was occupied by a party that night. The wine list at Francescana was very impressive. It had a good selection of Italian wines at decent prices. 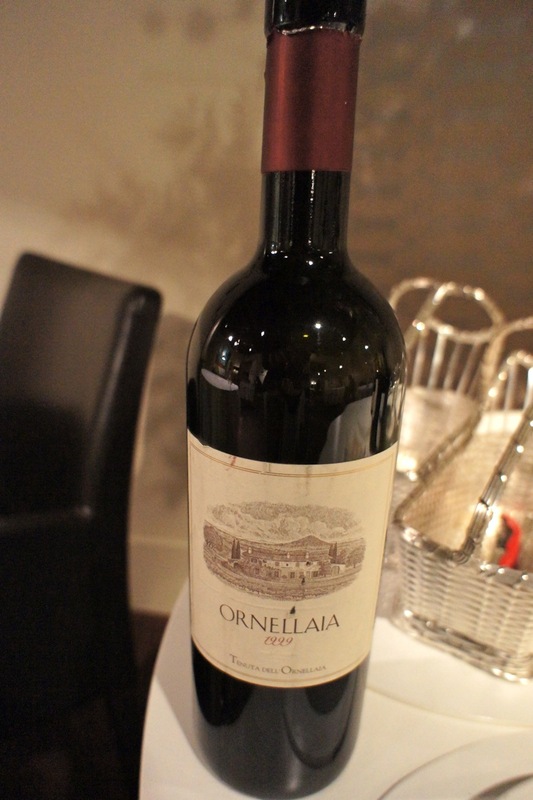 For some reason, the Ornellaia that night was quite well priced and after consultation with the sommelier (who in turn consulted with the chef to see if the wine would match with the classic degustation menu we were going to have), we decided to have the 1999 vintage of the supertuscan. It turned out to be a fantastic bottle of wine. The chef, Massimo Bottura, is known as one of the most innovative chefs in Italy with his 'molecular gastronomy'. He himself came out of the kitchen a few times during dinner to chat with us and the rest of the guests. Our prosecco was accompanied by two very innovative amuse bouche: the deconstructed mortadella (a type of ham) in the form of foam with pistachio, garlic cream and accompanied by a crostini (the bread), and the foie gras popsicle marinated with calvados brandy and balsamic vinegar, coated with chopped almonds. 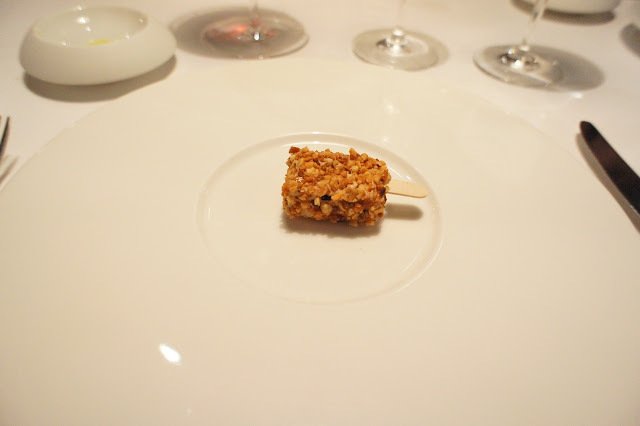 The foam was very rich and had the texture of whipped cream, and the popsicle was equally good, as the crunchy nuts went very well with the foie gras cooked in the style of au torchon. 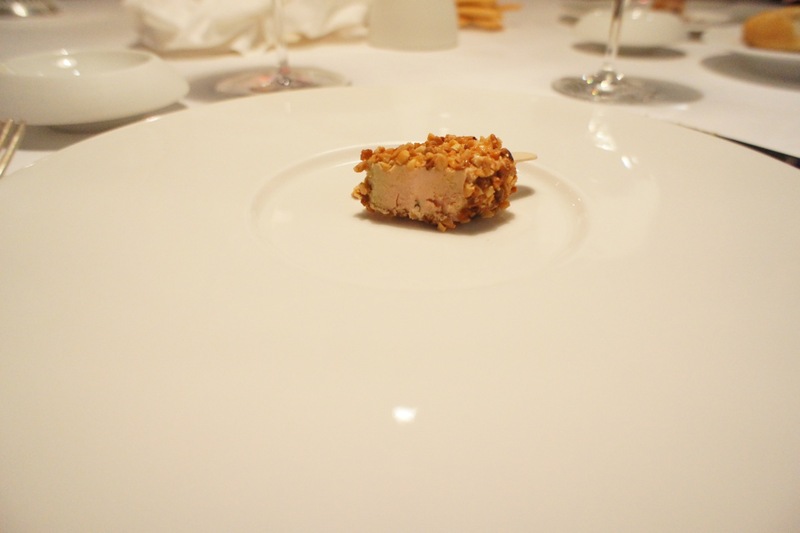 The calvados marinate was very subtle but gave the sweetness necessary to balance out the foie gras flavour. We then had the leeks with truffle, which was a wonderfully prepared dish. 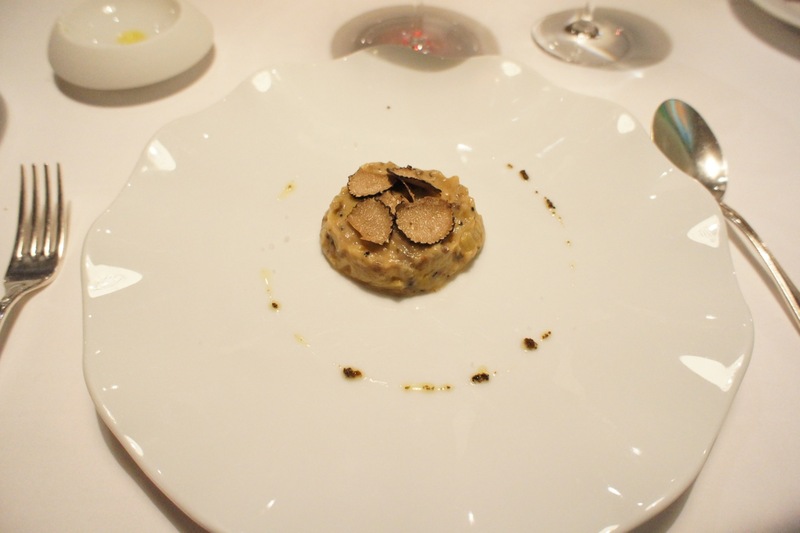 The creamy leeks complemented the black truffles well and gave the sense of earthiness. 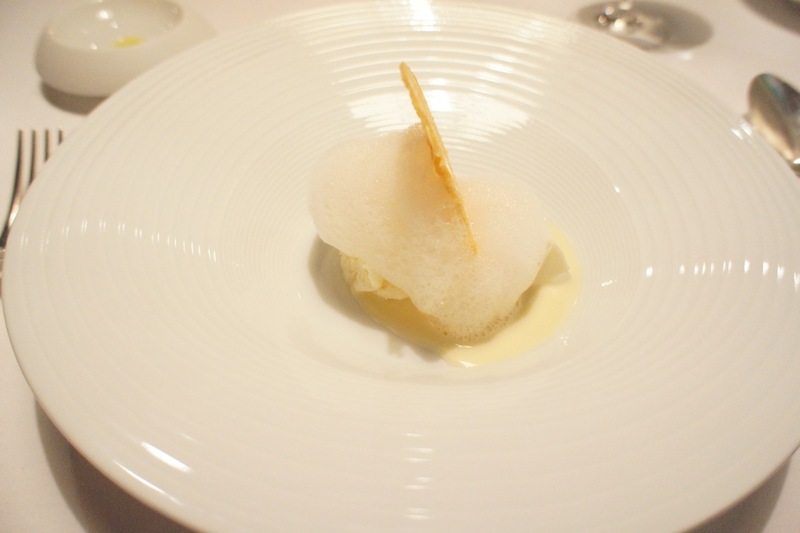 The next dish was the deconstructed parmesan cheese, consisting of 5 different aged parmesan cheeses prepared in 5 different ways: cheese crisp, cheese foam, cheese ice cream, normal cheese and cheese sauce. It was another light yet delightfully tasty creation by the chef. 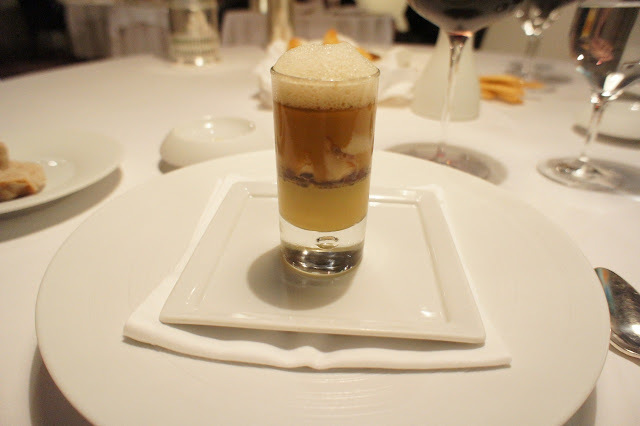 The most innovative dish of the evening was the deconstructed pasta with ragout sauce in a tall shot glass with parmesan and foie gras topped with rosemary foam. We are usually skeptical of food being made into a drink but taking a gulp of this really made you think that you had just eaten a pasta with ragout sauce with foie gras. 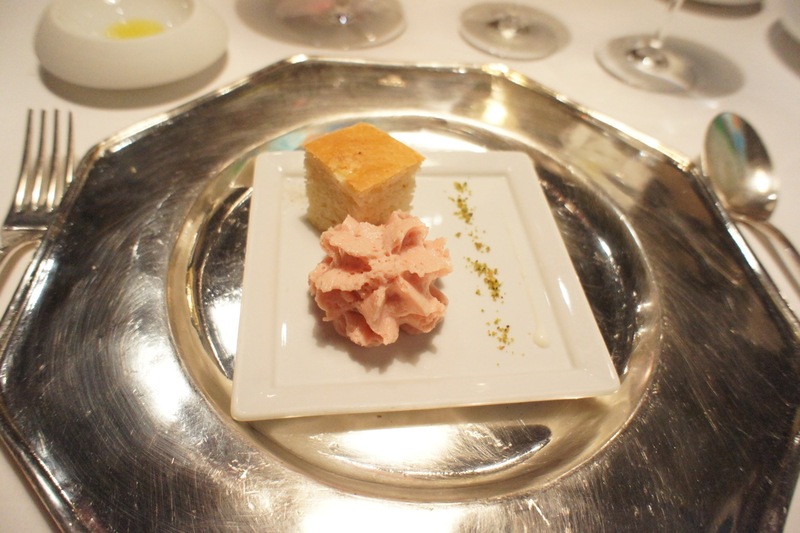 The rosemary foam gave a whiff of herbs typically sprinkled over pasta dishes. When we were having this dish, the chef Massimo came to speak to us. He mentioned that the idea of this dish was to create a middle ground between Robuchon (classic french cooking) and Adria Ferran (molecular gastronomy), at which place he would replicate his grandmother's cooking (we had actually read this exact quote he gave some time back on a blog, but we didn't blow his cover this time). This was followed by the ravioli with pork and lentils. 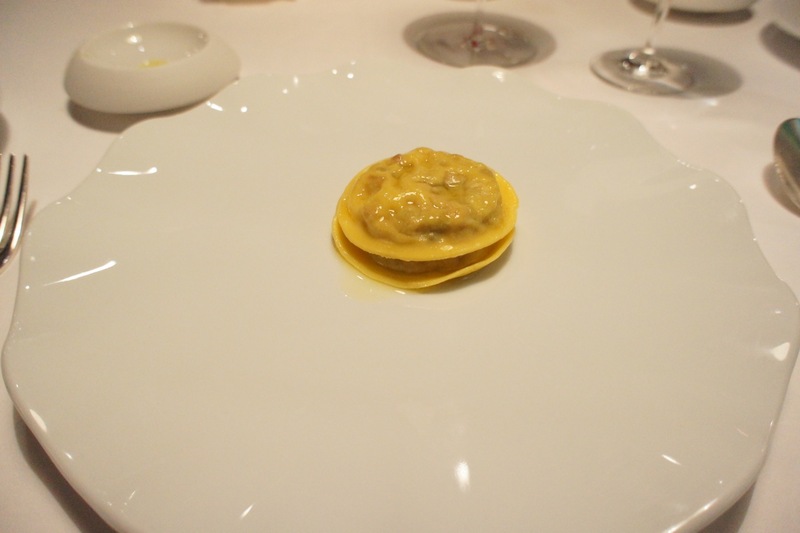 The ravioli tasted unlike the typical Italian pasta, as the texture and taste of the skin was different and reminded us of something closer to home. Chef Massimo came by and explained that he used a technique learnt from a chef in China. It was a tasty, but we didn't come all the way here to eat Chinese dumplings. 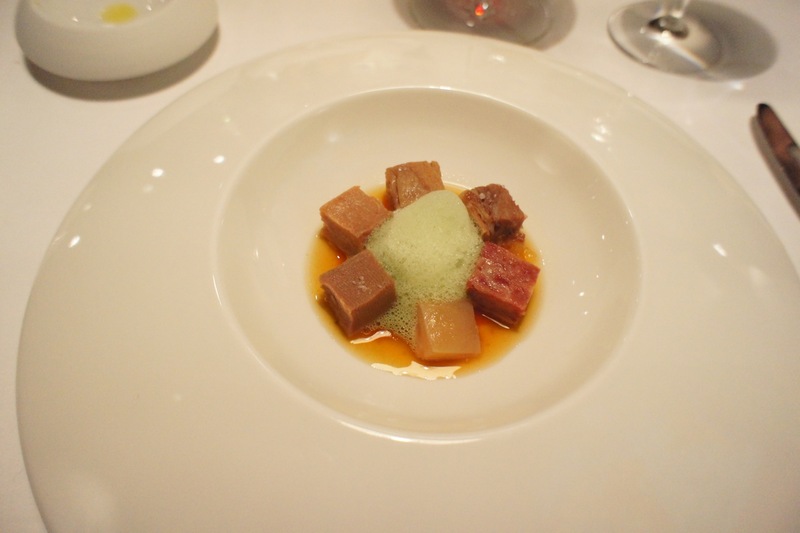 The final main course was the amazing 6 different parts of the cow with deconstructed foam of beef broth. It was a stunning dish as we worked through the various pieces each which differed slightly in texture yet was unified in taste. 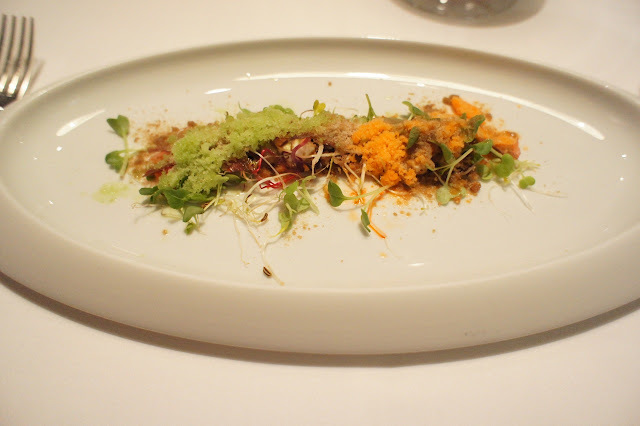 The palate-cleansing pre-dessert was a surprising raw garden salad with vegetable powder, which was somewhat reminiscent of a similar concept we've tried in Hajime in Osaka (see earlier review: Hajime). 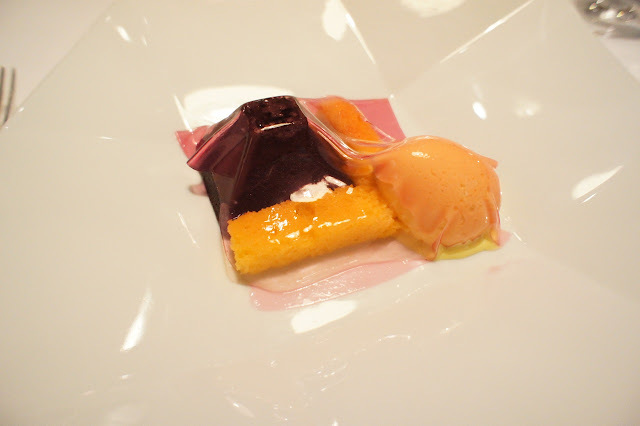 Dessert was a milk ice cream, dark chocolate cake and 2 sponge biscuits covered in a sweet berry-flavoured jelly layer. This was interesting as the ice cream, chocolate cake and sponge biscuits were not sweet, and hence we had to eat them together with the jelly in order for the full flavours to be enjoyed. 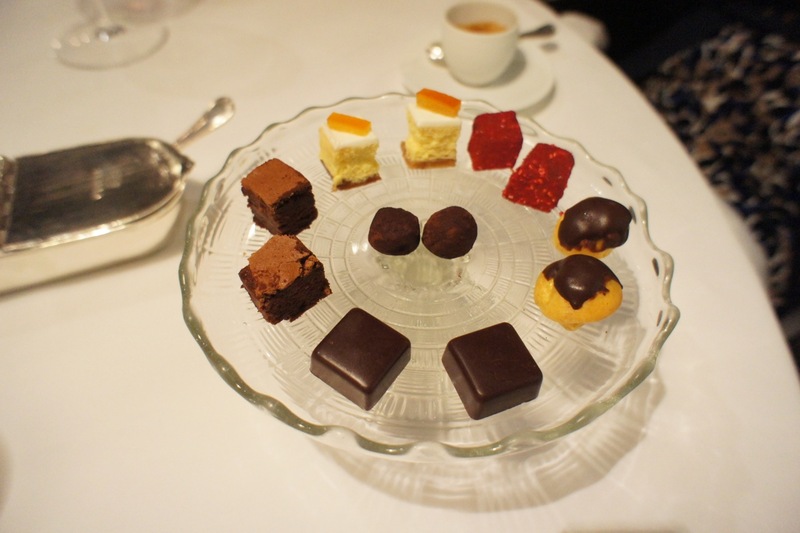 A nice platter of petit four and a doppio espresso each ended off a superlative meal. It was a really superb meal accompanied by an excellent bottle of wine, and made the long drive there and back worth the effort. Food: Superb, amongst the top of our list. Molecular gastronomy can be pointless at times but Chef Massimo pulled this one off perfectly. Very interesting! I'd like to try that dessert mmm. Looks like someone forgot to remove the wrapper on the dessert..
Wasn't that bad, we were very full after dinner..